Before Wednesday, some people may have said that Amazon has changed the way we shop online. But since yesterday’s announcement and the slew of press that followed it, there’s no question that Amazon has done anything less than revolutionize online shopping with the announcement of its Fire Phone. Visual. Fire uses Dynamic Perspective technology to read your eye movements and adjust its screen accordingly. Its 3D interface gives you the depth and perspective of real life, with a pixel display PC Mag says is comparable with the iPhone 5s. Intuitive. Features like auto-scroll make one-handed navigation a cinch, where the phone tracks a user’s motion to scroll by tilting, rather than touch, says TIME. Can’t wait to get your hands on the latest device from Amazon? 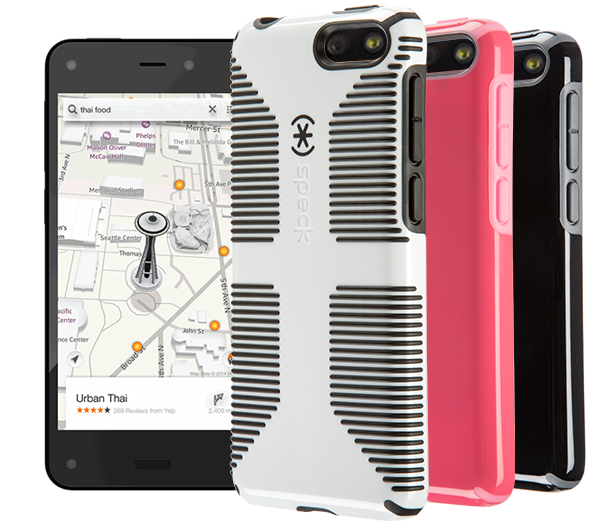 Keep up with #FirePhone buzz, and add one of our CandyShell cases for Amazon Fire on preorder to your shopping cart to pack your Fire with mighty slim protection from Speck.